Strong now likes it when you force open locks. Fixed various issues regarding the Mysterious Stranger entropy script playing multiple instances of its SFX with rapid fire weapons. Tweaked Sneak invisibility effect. Now disables itself when aiming down sight or attacking. Added script that cycles problem perks that tend to bug out for whatever reason when loading into the world. This should fix issues with combat regen effects not working as well as carry weight values being reduced by Strong Back rather than increased. There is also a new entry in the settings holotape to Cycle Perks in the same manner in the event one of them becomes bugged. The perks in question are Life Giver 3, Solar Powered 3, and all ranks of Strong Back. If you come across any other problem perks that don't seem to be working, let me know and I'll add them to the list. Auto-Hack/Unlocking should now properly factor in Companion Affinity. Fixed a bug with Quick Hands present in the Nuka World version of the mod. Forgot to disable a debug notification on Locksmith Rank 4. Rewrote ammo refund script to properly factor in random chance. Now also scales with strength and agility for Heavy Weapons and Commando respectively. Base chance is 33% (32+1 base stat). CompCodsworthPerk (Robot Sympathy) now also adds additional components to slain robots. This effect scales with all three ranks of Scrapper. Added auto-hacking and remote login functionality to Hacker Rank 4. Added auto-lock picking functionality to Locksmith Rank 4. Sneak Rank 5 will now apply an invisibility field that will last for five seconds. Quick Hands Rank 3 now grants 25 additional action points instead of 10. Close To Metal now provides 15% penetration of robot and synth resistances. Mysterious Stranger now works off of an entropy system where kills in VATS adds to the entropy pool. Once the pool reaches its cap (100) you will receive a message that will indicate that the Mysterious Stranger will appear in the next VATS instance. Rank 1 requires 10 kills (10 entropy per kill) in VATS to reach the cap. Rank 2-3 factor in 50/100% of base luck respectively, which are added to the entropy per kill value. After the Mysterious Stranger kills a target in this manner, your entropy will be reset to zero. This effect does not interfere with the base chance for the Mysterious Stranger to show up and should help mitigate the unreliability of the perk. Inspirational now provides additional benefits to companions. -25/50% critical damage at Rank 2 and 3 respectively. -50 carry weight at Rank 3. Added Heavy Lead Lined armor mods to Disciple/Operator/Pack armors. Corrected various display issues with some perk descriptions. Fixed an issue with Trigger Rush that resulted in the improper value and reduced the AP regen effect from +50% to +25% at all times. This change makes this perk far superior to the previous one, even with the reduction noted above. Added a condition check for players who already have the perks related to the holotape added in version 1.5 to gift them a holotape upon load. This check is vital for Survival players who do not have access to the console to add a holotape manually. Corrected some issues with the base Fallout 4 version of the mod. Ninja - All ranks now increase trap damage by 100/200/300% respectively, as well as poison and bleeding damage caused by traps. Now properly applies to unarmed, one-handed, and two-handed melee weapons at all ranks. Cap Collector - Rank 3 now provides 5% better buying/selling prices. As with previous ranks this bonus is multiplicative. VANS - Rank 1 movement speed bonus reduced to 10%. Rank 2 level requirement reduced from 36 to 26 and grants a 15% movement speed bonus. NEW Rank 3, requires level 40, increases movement speed by 20% and also reveals all map markers. The movement speed bonus on Ranks 2-3 do not work while in combat. Night Person - Changed the way Night Person Rank 2 night vision pop-up option functions and it now activates upon picking up the perk and after exiting the Pipboy menu as opposed to when you first load into the world (READ DESCRIPTION TO LEARN MORE). Rank 3 health bonus at night increased from 30 to 50. All three ranks now gain 10/20/30% bonus to all AP regen at night. This is a more multiplier. Fortune Finder - Rank 4 now has four options; Default, Automatic, Automatic Silent, Automatic Immersive. READ DESCRIPTION TO LEARN ABOUT THESE OPTIONS. Big Leagues - Rank 4 now has three options; Default, Power Attack, Ring Toggle. Rank 5 now has three options; Default, Sound Only, No Effects. READ DESCRIPTION TO LEARN ABOUT THESE OPTIONS. Scrounger - Rank 4 fill ammo chance increased from 5 to 10%. Heavy Gunner - Updated Rank 5 description to indicate that it has an improved chance to stagger which is not present in the base description. Basher - All ranks now have a chance to cause bleeding. Bleeding damage dealt increases with rank. 33% chance to cause bleeding, stacks. Ricochet - All ranks now grant a chance to dodge incoming ranged attacks by 2/4/6% respectively. Mister Sandman - Updated description to indicate that the damage bonus is additional. Ghoulish - Ranks 1-3 now scale proportionally with radiation resistance up to 100, providing the full heal amount. Any amount over that starts to cause a diminished effect. Ranks 1-3 now also increase melee and unarmed damage by 10/20/30% respectively, while you have at least 100 rads. Rank 4 removes the rad requirement and maintains the 30% buff at all times. For players that don't have Nuka World DLC, the effect on Rank 4 is moved to Rank 3. Cannibal - Ranks 1-2 restore 10% of base health on top of the base amount, while Rank 3 restores 20%. This bonus factors in Life Giver and Night Person Rank 3. Robot Sympathy (Codsworth) - Updated description to indicate that it reduces all energy damage done by robots by 10% rather than increasing resistance by 10. Berserk (Strong) - Now grants 10% bonus melee and unarmed damage at all times that increases to 30% when health drops below 40%. Previously did not include unarmed weapons. Trigger Rush (Cait) - Now increases AP regen by 50% at all times, and when health drops below 40%, ALL AP regen is increased by 50%. The latter effect is a more multiplier. Isodoped (Hancock) - You may now store an additional crit at all times. This bonus in addition to the base effect that increases critical charge rate when at 250 rads or more. Lessons In Blood (Gage) - Increased experience gain on kill from 5% to 15% and updated the description to indicate that the damage resistance component also includes energy resistance. Gift of Gab (Piper) - Now also increases all experience gains by 10% and speech challenge and location discovery bonuses have been increased from 2x to 5x. Shield Harmonics (X6-88) - Now also increases weapon damage dealt with the Institute Laser Weapon by 25%. Energy resistance increased from 20 to 25. Ninja, Sandman, and Cloak & Dagger now properly calculate bonus sneak attack damage regardless of the order taken. Upon loading into the world and after a short delay you will receive the option to disable Night Persons nightvision effect while indoors. If you decide to change your mind, search for "block night person" perk in the console and remove it. Changed script naming schema to use mod prefix CP. Please clean save before updating. Removed compatibility patches from the download. If you use any combination of my mods, please visit http://www.nexusmods.com/fallout4/mods/17957/? Simple update to fix VANS perk for Nuka World DLC. Noticed a fatal error in previous installs. I assumed the .ba2 files would act as convenient archives that the game could read as it does official .ba2 files. It turns out that this is not the case so everyone must download this version or later to receive all the necessary data. Previous versions were all missing necessary scripts for ammo refund effects. Chance to regain ammo that was exclusive to Heavy Gunners using Miniguns now also includes Flamers. Chance to regain ammo now works for automatic weapons if you have the first rank of the Commando perk. Added missing data for Heavy Lead Lined armor mods to Far Harbor DLC armor; Marine and Trapper. Combined both mod versions together in a new FOMOD format for ease of installation. Noticed an oversight with the addition of the cripple chance added to Rank 4 of Basher that caused the cripple chance from Rank 3 to stack additively with Rank 4 instead of being replaced upon upgrading. This has been fixed. IMPORTANT NOTICE: PLEASE PERFORM A CLEAN SAVE BEFORE UPDATING TO v1.6+. PLEASE READ CHANGE LOGS BEFORE UPDATING. IF YOU'RE NOT SURE HOW TO DO SO, HERE'S BRUCE WAYNE HIMSELF TO EXPLAIN THE PROCESS, CLICK ME. UPDATE v1.5 and later - FOMOD Installer should now automatically detect which version should be installed. Also removed all loose scripts from the installer and moved back to .ba2 archives since I figured out what the problem was previously. Make sure to remove any scripts from your Data/Scripts folder that start with CP, as they are no longer necessary and may cause problems. I would like to thank those of you who have downloaded the mod and given me an endorsement. It means a lot to know that at least somewhere someone out there is enjoying the work I put into my mods. Also many thanks to Wenderer for his wonderful FOMOD Creation Tool. Go check him out over there ---> CLICK ME! I felt that some of the perks could use some tweaking so that's what this is. Some perks are just simply underwhelming and I found myself either looking at them objectively thinking that "I would never waste a point on that" unless there was nothing left to choose, or "I want to make a build using this or that" but always ended up in a position where I could get the perk but chose not to simply because other options were better at the time. This inevitably led to me mostly ignoring them to the point where the build didn't even feature the perk - Party Boy in this case. Hopefully now with these tweaks I, and others, might feel more inclined to actually consider these perks without feeling like they could have made a better choice than the one they ultimately made. The download contains four versions. Select which version applies to you - either Fallout 4, Fallout 4 with Far Harbor, Fallout 4 with Nuka World, or Fallout 4 Complete Pack for users with both Far Harbor and Nuka World. If you have any DLC other than Far Harbor and Nuka World, use the Fallout 4 version. 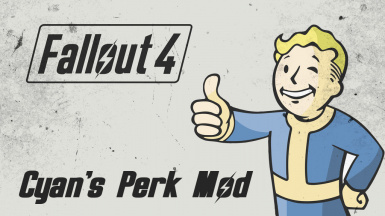 Place "Cyan's Perk Mod.esp" and "Cyan's Perk Mod - Main.ba2" into your Data folder. If you use any combination of my mods make sure you download my Compatibility Pack below and be sure the file it installs is loaded after my main files (Cyan's Perk Mod, Cyan's Weapon Mod, etc). The pack will automatically detect active mods of mine and install the necessary file. The files it installs uses abbreviated names to indicate which mod combinations each version applies to, i.e. "CAM-CPM CP.esp" for those using Cyan's Armor Mod and Cyan's Perk Mod together. Big Leagues - Rank 4 sweep effect should no longer damage non-hostile targets. (v1.5) Due to the nature of the perk entry for Sweep effects granted to Rank 4 of Big Leagues it doesn't seem possible to check for friendly targets. In light of that fact, version 1.5 adds two different options to help combat this limitation which you can read about at the bottom of the page. Rank 5 now has options to disable the Pipboy animation and/or homerun sound effect (learn more at the bottom of the page). Heavy Gunner - Rank 1 now grants a chance to be refunded some ammo when using miniguns and (v1.3) flamers. This effect only works while in direct combat. (v1.5) Updated Rank 5 description to indicate that it has an improved chance to stagger which is not present in the base description. (v1.6) Now properly takes random chance into account and the chance to be refunded is increased with strength. Base chance is 32% + Strength. Strong Back - Ranks 1 and 2 now also reduce equipped armor weight by 25/50% respectively. Ranks 3 and 4 further increase carry weight by 75/100 respectively, while Rank 5 increases carry weight by 150. Basher - Each rank now deals 50/100/150/200% more damage. Rank 4 now also has a 20% chance to cripple. The tooltip for this rank states that it has an increased chance to cripple however there was no data to support this claim, therefore I included it. (v1.5) All ranks now have a 33% chance to cause bleeding that stacks. Bleeding damage dealt increases with rank. Refractor - Ranks 3 and 4 now grant 60/120 energy resistance respectively. Night Person - (v1.5) Rank 3 health bonus increased from 30 to 50. All ranks now also increase ALL AP regen by 10/20/30% at night, respectively. Rank 2 now has options to disable night vision when indoors (learn more at the bottom of the page). Locksmith - (v1.6) Rank 4 now provides auto-lock picking functionality. Strong now likes forced lockpicking. Toughness - Ranks 3 and 4 now grant 60/120 damage resistance respectively. Lead Belly - Ranks 1 and 2 now grant 10/20% increased effect from food sources, while Rank 3 grants a 50% increase. This includes other bonuses on food sources. Lifegiver - Health regen granted from Rank 3 now also works while in combat at 25% effectiveness. This works out to 0.125% of health per second, or 1% every 8 seconds. Aquaboy/Aquagirl - Rank 2 now grants 25% increased swim speed as well as a 50% chance to avoid incoming damage while swimming. Rad Resistant - Rank 2 now grants additional benefits to RadX (10 health, action points, damage/energy resist per application). Rank 3 grants access to new Heavy Lead Lined armor mods which provide twice the radiation resistance of normal Lead Lined mods. Rank 4 provides +60 radiation resistance. Solar Powered - Health regen granted from Rank 3 now also works while in combat at 25% effectiveness. This works out to 0.125% of health per second, or 1% every 8 seconds, or 1% every 2 seconds when paired with Lifegiver. Ghoulish - (v1.5) Ranks 1-3 now scale proportionally with radiation resistance up to 100, providing the full heal amount. Any amount over that starts to cause a diminished effect. Ranks 1-3 now also increase melee and unarmed damage by 10/20/30% respectively, while you have at least 100 rads. Rank 4 removes the rad requirement and maintains the 30% buff at all times. For players that don't have Nuka World DLC, the effect on Rank 4 is moved to Rank 3. Cannibal - (v1.5) Ranks 1-2 restore 10% of base health on top of the base amount, while Rank 3 restores 20%. This bonus factors in Life Giver and Night Person Rank 3. Party Boy/Girl - Rank 1 now grants 10% damage reduction when accompanied by a companion and under the effects of alcohol. Rank 2 now also doubles the duration of alcohol. Rank 3 now grants 15% damage reduction (overrides Rank 1) and triples the duration of alcohol. Cap Collector - (v1.5) Rank 3 now also provides 5% better buying/selling prices. As with previous ranks this bonus is multiplicative. Inspirational - (v1.6) Now provides additional benefits to companions based on respective rank, and they use an improved Combat Style. - 25/50% critical damage at Rank 2 and 3 respectively. - 50 carry weight at Rank 3. V.A.N.S - (v1.5) Rank 1 now provides a 10% increase in movement speed. Rank 2 level requirement reduced to 26 from 36 and provides a 15% increase in movement speed. NEW Rank 3 requires level 40, increases movement speed by 20% and also reveals all map markers. The movement speed bonus on Ranks 2-3 do not work while in combat. Nerd Rage! - Now activates at 40% health instead of 20%. Hacker - (v1.6) Rank 4 now provides auto-hacking and remote login functionality. Ninja - (v1.5) All ranks now increase trap damage by 100/200/300% respectively, as well as poison and bleeding damage caused by traps. Now properly applies to unarmed, one-handed, and two-handed melee weapons at all ranks. Mister Sandman - (v1.5) Updated description to indicate that the damage bonus is additional. Commando - (v1.3) Rank 1 now grants a chance to be refunded some ammo for all automatic weapons covered by the perk. This effect only works while in direct combat. (v1.6) Now properly takes random chance into account and the chance to be refunded is increased with agility. Base chance is 32% + Agility. Sneak - (v1.6) Rank 5 will now apply an invisibility field that lasts for five seconds upon activating sneak. Quick Hands - (v1.6) Rank 3 AP bonus increased from 10 to 25. Fortune Finder - (v1.5) Rank 4 now has options that change the behavior of the "Shower of Caps" effect on this perk (learn more at the bottom of the page). Scrounger - (v1.5) Rank 4 fill ammo chance increased from 5 to 10%. Ricochet - (v1.5) All ranks now grant a chance to dodge incoming ranged attacks by 2/4/6% respectively. Mysterious Stranger - (v1.6) Now works off of an entropy system where kills in VATS add to the entropy pool. Once the pool reaches its cap (100) you will receive a message that will indicate that the Mysterious Stranger will appear in the next VATS instance. Rank 1 requires 10 kills (10 entropy per kill) in VATS to reach the cap. Rank 2-3 factor in 50/100% of base luck respectively, which are added to the entropy per kill value. After the Mysterious Stranger kills a target in this manner, your entropy will be reset to zero. This effect does not interfere with the base chance for the Mysterious Stranger to show up and should help mitigate the unreliability of the perk. Robot Sympathy (Codsworth) - (v1.5) Updated description to indicate that it reduces all energy damage done by robots by 10% rather than increasing resistance by 10. (v1.6) Now also lets you salvage more components from slain robots. This effect scales with all three ranks of Scrapper. Berserk (Strong) - (v1.5) Now grants 10% bonus melee and unarmed damage at all times that increases to 30% when health drops below 40%. Previously did not include unarmed weapons. Trigger Rush (Cait) - (v1.5) Now increases AP regen by 25% at all times and when health drops below 40%, ALL AP regen is increased by 50%. Isodoped (Hancock) - (v1.5) You may now store an additional critical hit at all times. This bonus is in addition to the base effect that increases critical charge rate when at 250 rads or more. Lessons In Blood (Gage) - (v1.5) Increased experience gain on kill from 5% to 15% and updated the description to indicate that the damage resistance component also includes energy resistance. Gift of Gab (Piper) - (v1.5) Now also increases all experience gains by 10% and speech challenge and location discovery bonuses have been increased from 2x to 5x. Shield Harmonics (X6-88) - (v1.5) Now also increases weapon damage dealt with the Institute Laser Weapon by 25%. Energy resistance increased from 20 to 25. Close To Metal (Nick Valentine) - (v1.6) Now also provides 15% penetration of robot and synth resistances. Basher - Rank 2 now properly cripples 10% of the time instead of 100% of the time. Chemist - Now properly requires 7 Intelligence instead of 5. Medicine Bobblehead - Now properly stacks with Rank 4 Medic, healing for 110% instead of 108% previously. Ninja, Sandman, and Cloak & Dagger - (v1.5) Now properly calculate bonus sneak attack damage regardless of the order taken. These options can be changed at any time using the provided "Cyan's Perk Mod [Settings]" holotape which will now be automatically provided upon load, compliments of v1.5b.